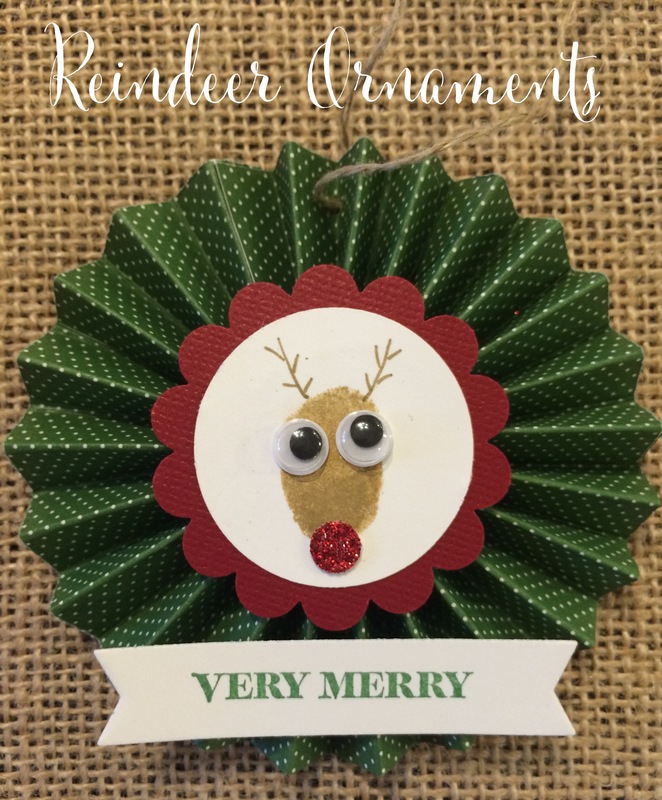 I was so excited to find this little reindeer keepsake ornament idea on Pinterest yesterday. The original post which inspired these cuties can be found here. I just happen to have a few extra rosettes made up from a previous project, so all that was left was to make the adorable little reindeer out of thumbprints, add a little sentiment and some linen thread and voila! A perfect little keepsake to give as a gift or to keep. 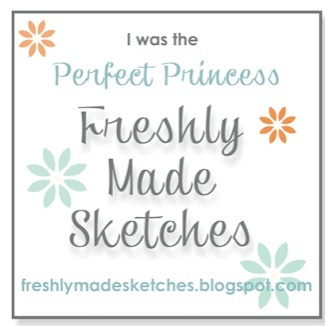 They are made entirely with Stampin’ Up! 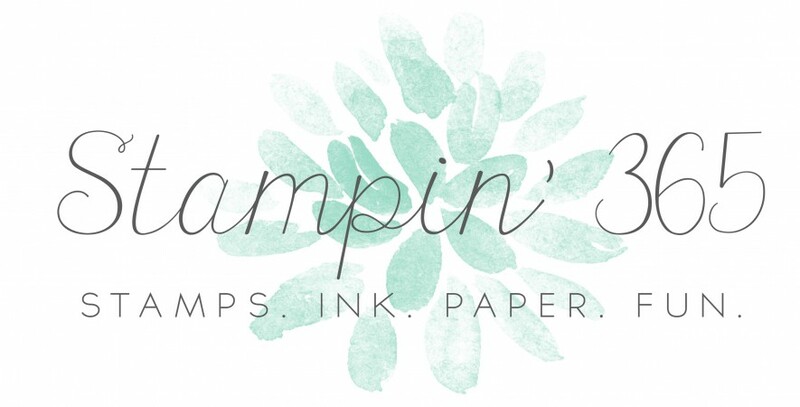 products, so I decided to enter them in the Stampin’ Up Only challenge blog. They’re challenge? 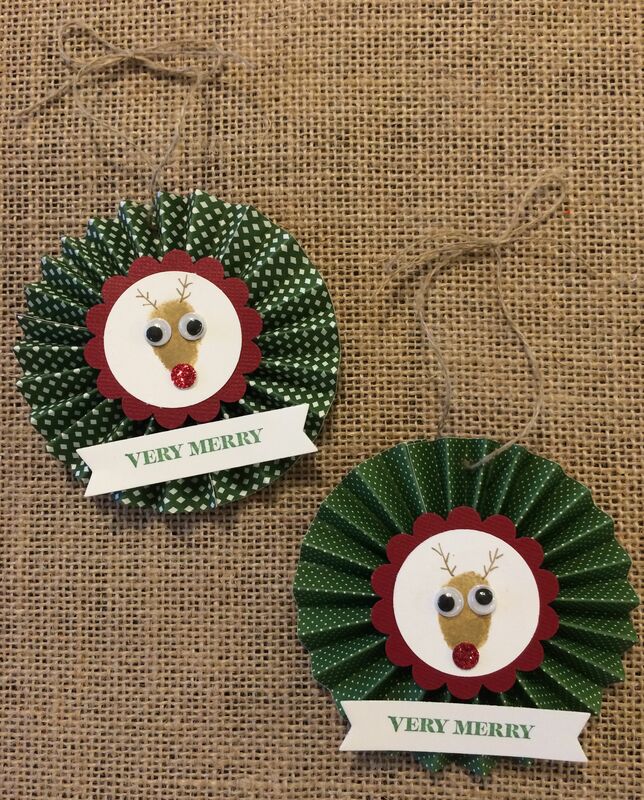 Create something that conveys the season greetings of Merry or Happy, and these little merry reindeer make me very happy! Now I’m off to clean- we are having a huge Christmas Eve celebration at our house and I want everything to be ready. Thanks so much, Uncle Dale, that means so much to me! Very cute! Hope you have an amazing Christmas Eve party and a very Merry Christmas. Thank you, Jeannette, a Very Merry Christmas to you, as well! So so adorable!! !~Just like you! Ohhh these are SO sweet! I wish I’d seen them before today because I had my little grandson with me this afternoon and we could have made these. 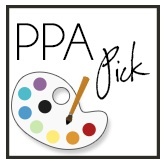 He’s three going on a cheeky monkey, and LOVES finger printing (edpecially Grammy’s reading glasses), and best of all … he ADORES googly eyes – so this little project would have been a winner. Perhaps I could squeeze one of these in on Christmas day afternoon – while everyone else is trying to get over eating too much! I’ll be roped into playing cars (I always have to be the police car – apparently I’m bestest at making the noise and sounding like a policeman! lol) – and once he gets bored with that, perhaps we can put the protective covering on the table and get the glue, a stamp pad, some pretty papers and googly eyes out! I think I even have some teeny weeny red pom poms (for noses) left in the drawer! Oh, I do hope you have a chance to make these. We had so much fun! I taught preschool (3s and 4s) for 6 years and I just love that age. Going on “cheeky monkey” indeed! A Very Merry Christmas time with your family, as well. Hugs and happy crafting. These are so cute!! 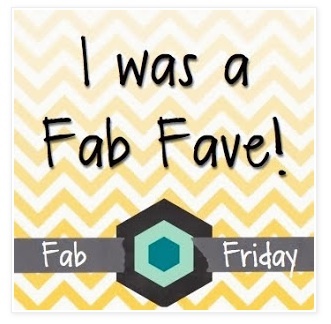 Love the thumbprint idea along with the use of the rosette! Thanks for playing along with us at SUO Challenges- have a Merry Christmas! Thank you, Julie, and a very Merry Christmas to you, as well! how cute are they??? amazing creativity!!! Love love the sparkly noses. These little guys are so so adorable!